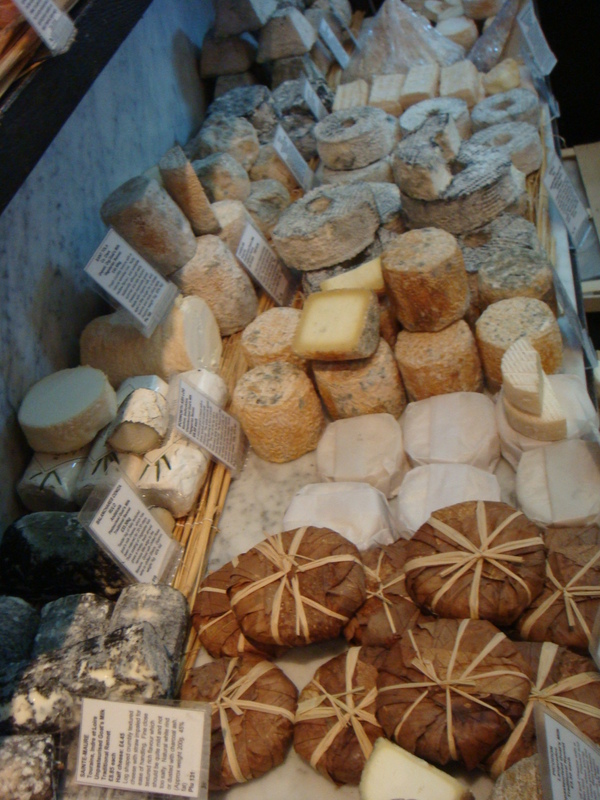 I love La Fromagerie!! 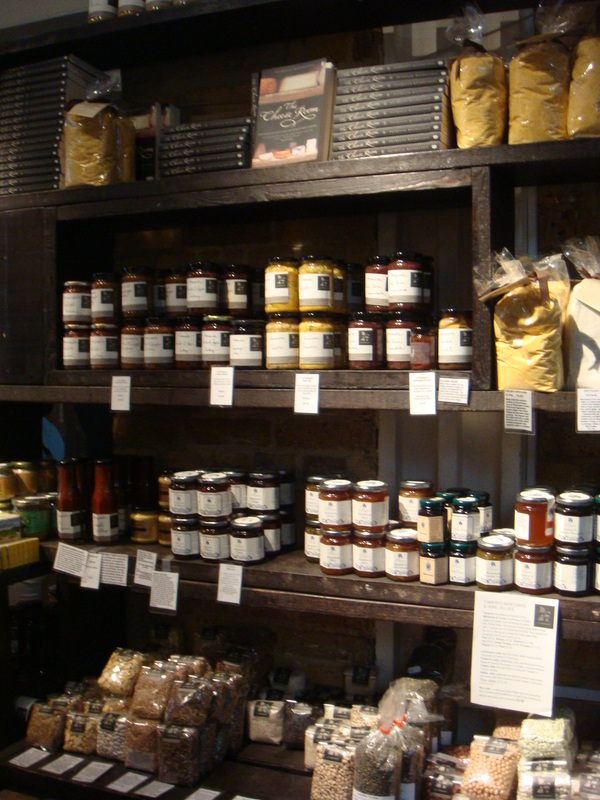 A shop dedicated to the love of artisan cheese and good produce. If you have ever heard Patricia Michelson speak you will understand what I mean. 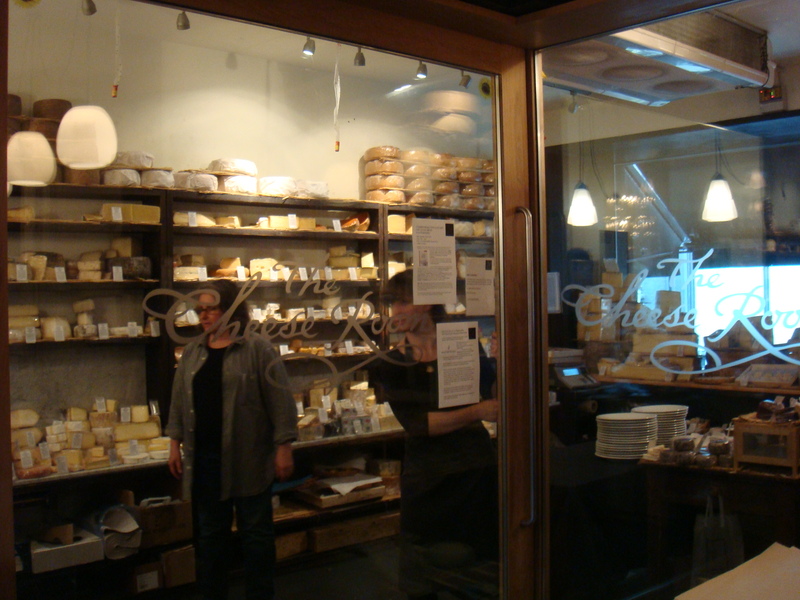 She is madly passionate about her cheese and the produce in her shop. It all started, for Patricia, when she was skiing in Meribel, France, got lost on the mountain and by the time she found her way to the bottom, had worked up quite an appetite. She bought a slice of Beaufort Chalet d’Alpage cheese, with the little she had in her pockets, and continued to nibble away at it while she walked back to her chalet. From that moment on her life changed and she knew she had to bring good cheese to London. 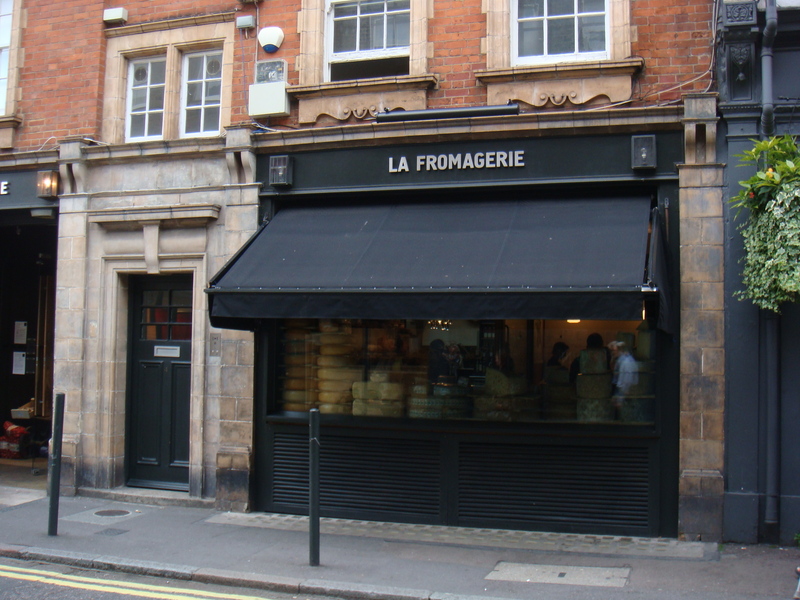 First to open was the little Highbury Park shop in September 1992, then Moxon st, Marylebone in November 2002. 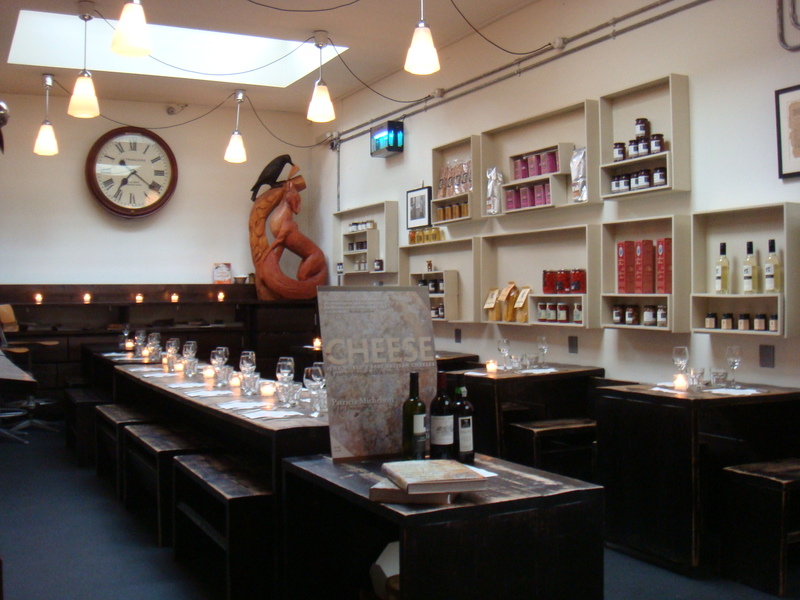 This was a seated tasting, the first to commemorate the release of her second book, CHEESE. When I arrived I was shown to a more secluded area in the shop where I was presented with a glass of Cremant d’Alsace Rose. Then came the La Fromagerie ‘signature event nibbles’, gougeres and Parmesan twists. The gougeres were amazing, as usual, although the cayenne hit to the twists was a bit strong for me. After a top up, I strolled around the shop. The tables, which usually seat a high turn over of hungry people, were being prepared for our evenings tasting. 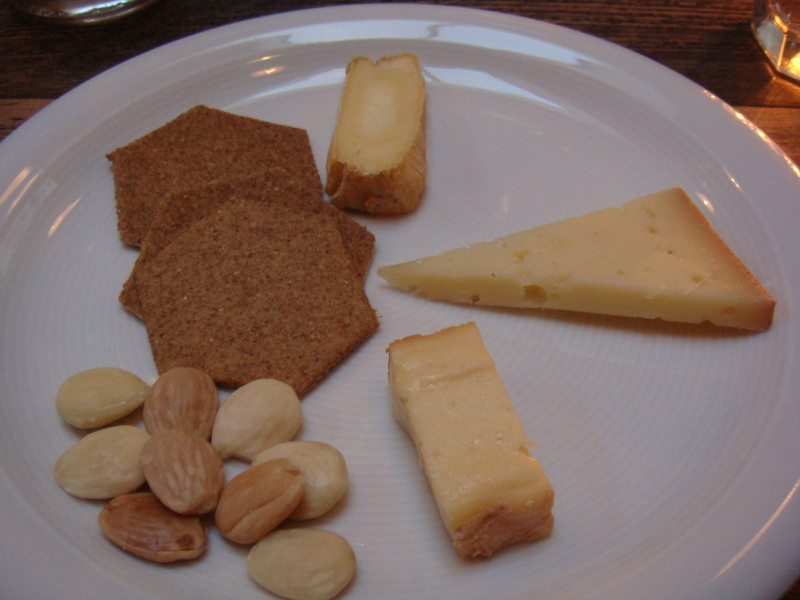 The first plate to be presented to us was a selection of ‘summer cheeses’. INNES BUTTONS, Statfold, Stafforshire: a prize winning, light mousse-like goats cheese, where the goats are played classical music whilst being milked. SAINT TOLA, Co. Clare: fresh crumbly texture, made with organic milk. When aged has a more citrus taste. These goats are rested for 3 months after Christmas when the cheese is unavailable. TICKLEMORE, Totnes, Devon: one of my favourites!! semi-soft, using unpasteurised goats milk. This cheese is fresh and gentle. In autumn and winter layer it with celeriac and potatoes for an amazing gratin. WIGMORE, Riseley, Berks: an unpasteurised sheep’s milk cheese using vegetable rennet. This cheese is from a cheese maker intent on keeping there cheese Artisian and not overproducing. WATERLOO, Riseley, Berks: THE TABLE WINNER! a semi-soft cows cheese, made with vegetable rennet. It was rich, bold and very buttery, with a gentle earthy aroma. KIRKHAM’S LANCASHIRE, Goosnargh, Lancashire: probably my least favourite. A semi-hard unpasteurised cloth bound cow’s milk cheese. This type of cheese has been made for hundreds of years. Patricia feels that it hold all the signs to pre-date Ossau cheeses of the Pyrenees. Wine Pairing: Chateau Le Roc Cotes du Frontonnais, SW France. 50% Colombard and 50% Ugni Blanc. A wine made south west of Toulouse. A light zest wine giving an intense aroma of grapefruit and orange whilst tasting lovely and fresh with a long fruity palate. What a perfect match to the cheese Patricia had chosen. 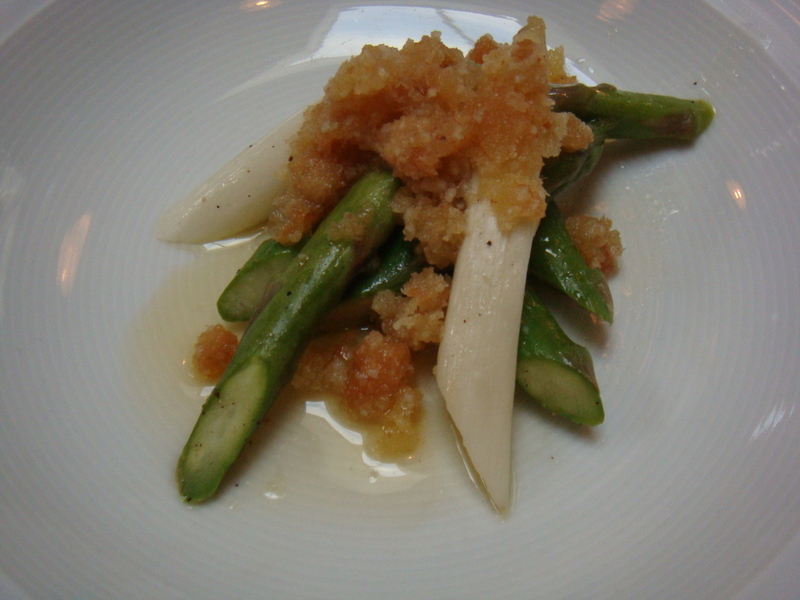 As an interlude to the cheeses, we were served Asparagus with buttered breadcrumbs and Berkswell. The green and white asparagus were a welcome relief but the breadcrumbs were soaked in too much butter for my liking and I left most of them. Our next plate was a surprising Irish selection. MILLENS, Eyeries, Nr Castletownbere, Co. Cork: rustic earthy cheese made with pasteurised cows milk. ARDRAHAN, Co.Cork: Favourite on the plate! a semi-soft washed rind cows milk cheese made with vegetable rennet. Style similar to a French Munster or Livarot. It was earthy, rustic and nutty. ST. GALL, Fermoy, Co. Cork: brine washed cows cheese with a earthy creaminess. Wine Pairing: Chateau Beaulieu, Marmande, Lot et Garonne, nr Bordeaux. A Blend of Merlot, Cabernet Franc, Cabernet Sauvignon and a local grape, Abouriou. We all thought it worked perfectly with the cheeses and very enjoyable to drink. Devon Blues, Totnes, Devon: we LOVED this, rich and creamy unpasteurised cows milk cheese. Buttery and gently earthy….delicious! Harbourne Blue, Totnes, Devon: made with goats milk, this is an unusual blue. You seldom find goats blue as it takes alot of goats to get enough milk to make a large wheel. It was very full, sharp and fruity. Colston Bassett Stilton, Nottinghamshire: made with pasteurised cows milk using traditional rennet. 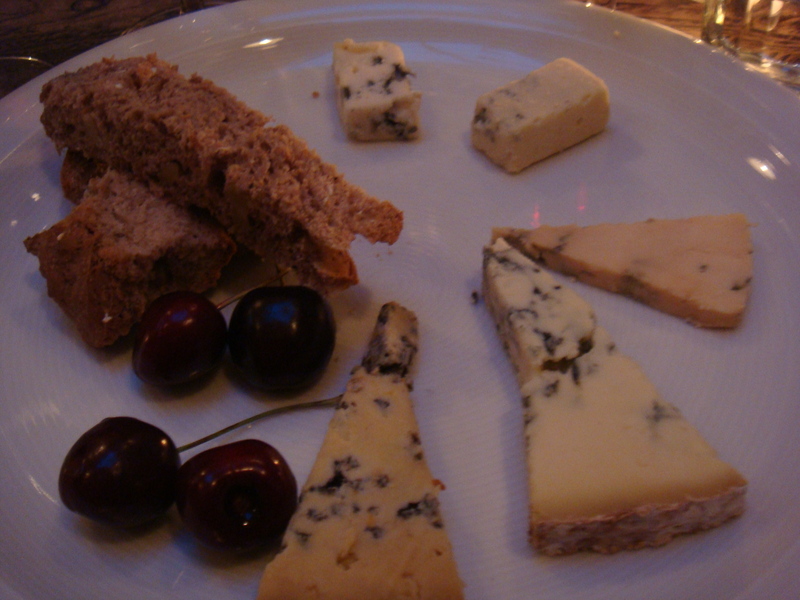 The makers allow the cheese to mature for 3 months before introducing the blue. It is nutty and rich, a more complex blue. Bellingham Blue, Castlebellingham, Co. Louth: this cows milk blue will ‘knock your head off’. It is the strongest blue I have EVER tasted. It is sharp and salty (wait for autumn I think). Wine Pairing: Quinta de la Rosa Tawny Tonel No. 12: delicate, soft with caramel and honey aromas. Perfect. It was a hot night, and I left, to make my way home in the cool summer breeze with a tummy full of cheese and a happy feeling that I had been well looked after. Patricia was the perfect hostess. Thank you.